I suppose I'm asking for trouble by putting a diary entry up today, but I happen to have a bit of free time, and a reason to put up photographs. Today, Yuriko and I went cherry blossom viewing. As I am sure I've mentioned before, cherry blossom viewing, o-hanami, is a strong custom in Japan. When the cherry trees blossom, lots of people take their blue groundsheets and head off to the nearest park to sit under the trees, ignore the flowers, and have a party. Taking at least a packed lunch is practically compulsory, and some people take very elaborate meals. 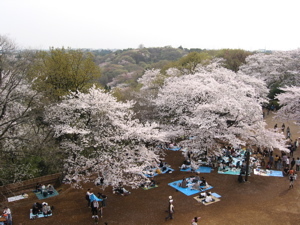 The cherry blossoms in Ikuta Ryokuchi, from the top of the observation platform. You can see some people enjoying them. We weren't into being very elaborate, so we just bought some sushi at a takeaway sushi shop near our flat, and then walked to Ikuta Ryokuchi Park, which is about thirty minutes' walk from home. The park is quite large, but the cherry trees are planted on top of the highest hill. That meant a walk up a steep slope to get to them, so Yuriko got a bit tired. The walk was, however, nice, with some blossoming cherry trees along the way, and nice views over the park. The trees at the top were in full bloom, and the parties underneath them were in full swing. Fortunately, being a local park, it wasn't so packed that we couldn't find anywhere to sit, although we did have to look around a little bit. We arrived a bit before 2pm, so the people who had come for lunch were starting to pack up; it got a bit quieter as we ate and chatted. Today really was the perfect day this year, I think. The weather was just right, warm, with a bit of a breeze, and the cherry trees seemed to be at the peak of their flowering. So, we sat underneath the trees, admired the flowers, and enjoyed our sushi. 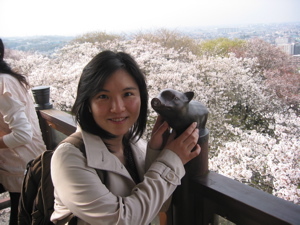 Yuriko on the observation platform, with the boar. The hill used to be the site of a castle, and while there is nothing left of it, there is a viewing platform built in a sort of rough castle shape. The top of the platform is higher than the tops of the cherry trees, so we went up to have a look around. The view is really quite spectacular. It's also not purely cityscape. Partly because the hill is in the middle of a park, and partly because northern Kawasaki actually has quite a lot of green areas, the view also includes several tree-clad hills. On a clear day, you can apparently see Mount Fuji, but today was not clear enough for that. Still, we both really enjoyed the view. The railing around the platform is decorated with small bronze statues of the twelve animals of the Chinese zodiac. The animals are also associated with directions, so I assume that each statue was in the appropriate place. The statues are quite cute, so we took some pictures of us with them. I was born in the year of the boar (not "bore", so stop sniggering at the back), so the photograph shows Yuriko cuddling my animal. We had a really pleasant afternoon, and saw lots of small children who looked like they were enjoying themselves, so we plan to go back when we have a small child. We may go back before then, as well; I think Mum and Ray would really like the park. Copyright David Chart 2007. All Rights Reserved.